Fabaceae, or legumes, are mostly herbs but include also shrubs and trees found in both temperate and tropical areas. They comprise one of the largest families of flowering plants, numbering some 400 genera and 10,000 species. Peanuts, beans, peas, wisteria and locust trees are among the family. 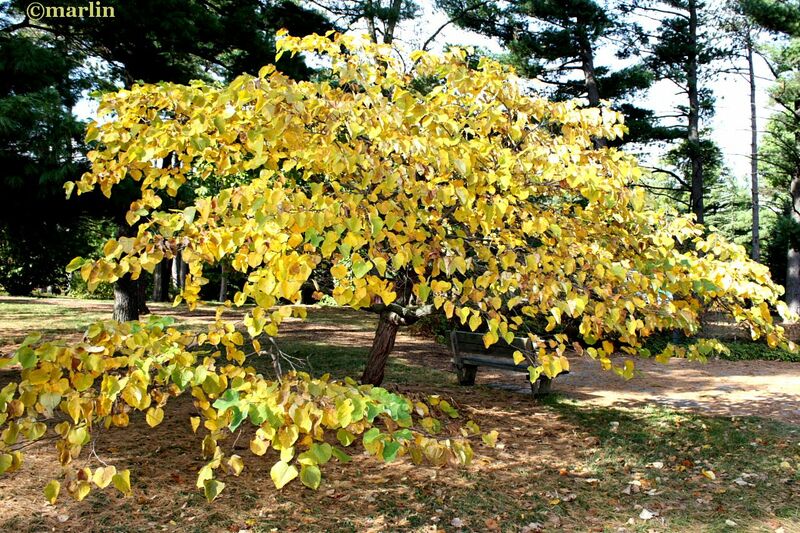 Redbud is a popular small to medium sized ornamental, growing to about 15 feet tall and as many wide – but it can be twice that size given optimum growing conditions. A fast-grower when young, it starts with an upright vase-shape, becoming spreading and rounded (and often leaning) with age. It can be single or multi-trunked and low-branching. Exterior bark is brown-gray in thin exfoliating strips or thin fissured plates in youth, becoming criss-crossing and raised with age, while the cinnamon-orange interior bark reveals itself with age, for an overall ornamental bark characteristic. 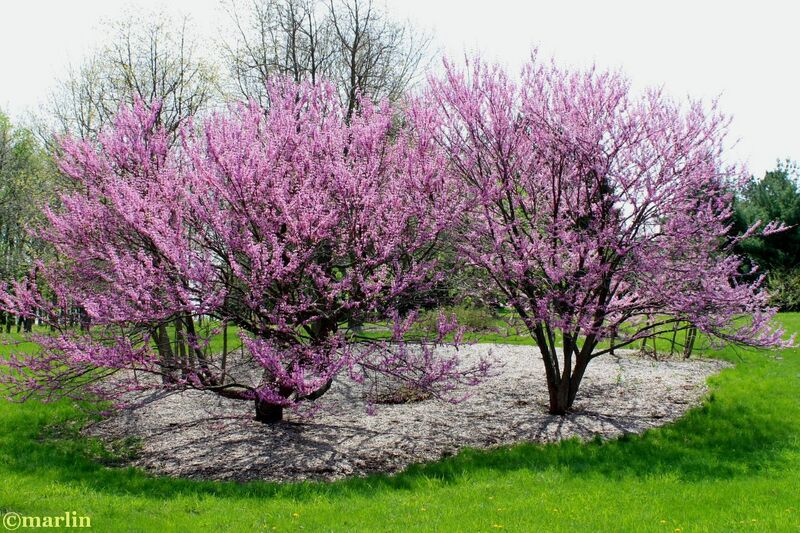 Redbud grows well in full sun or partial shade. It prefers moist, rich, well-drained soil, but is somewhat adaptable to more marginal soils. It is widely available in ball and burlap as well as container form. These redbud provides a striking pink to reddish purple floral display in April and early May (here, about 35 miles due west of the city of Chicago), before the foliage emerges. Redbud is a regular but usually not a common understory component of many forest types throughout the Eastern United States. It is not a commercial timber species, and although it grows in many forest cover types, it is not listed in all of them by the Society of American Foresters. This forest-edge tree needs sunlight to produce its namesake blossoms, yet it will suffer in full summer heat. Redbuds grow best in part shade in well-drained soils high in organic matter. The shallow root system will benefit with a 3-4-inch layer of organic mulch. Redbuds vary in hardiness; buy from a local or regional source. Purplish-pink buds occur along the branches in early May. Dark green, heart-shaped leaves turn a nice yellow fall color. The brownish-black bark on older trees often has an inner orange-red coloration. Distinct zigzag branching pattern on new growth. They make wonderful specimen plants especially with evergreen masses, thus providing contrast for the floral display and supplying protection from intense sunlight. 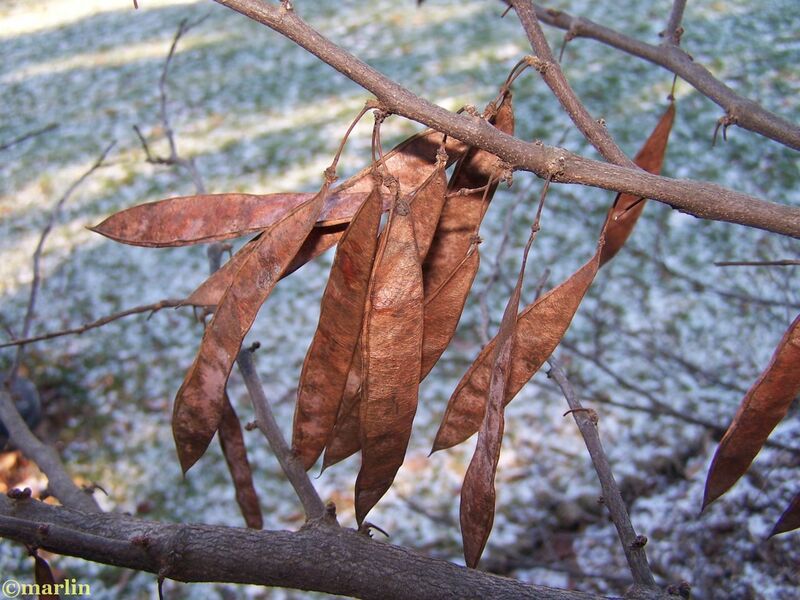 Damaging Agents- Redbud is a host to a variety of insects, but damage is not normally severe. Bark and phloem borers include three species of Hypothenemus, and Pityophthorus lautus. A seed beetle, Gibbobruchus mimus, breeds in the seed of redbud. Numerous wood borers have been found in redbud. Agrilus otiosus, three species of Hypothenemus, three species of Micracis, two species of Microcisella, Pityophthorus lautus, Ptosima gibbicollis, and Thysanoes fimbricornis all inhabit portions of the wood of redbud. Other insects feed on the leaves of redbud. 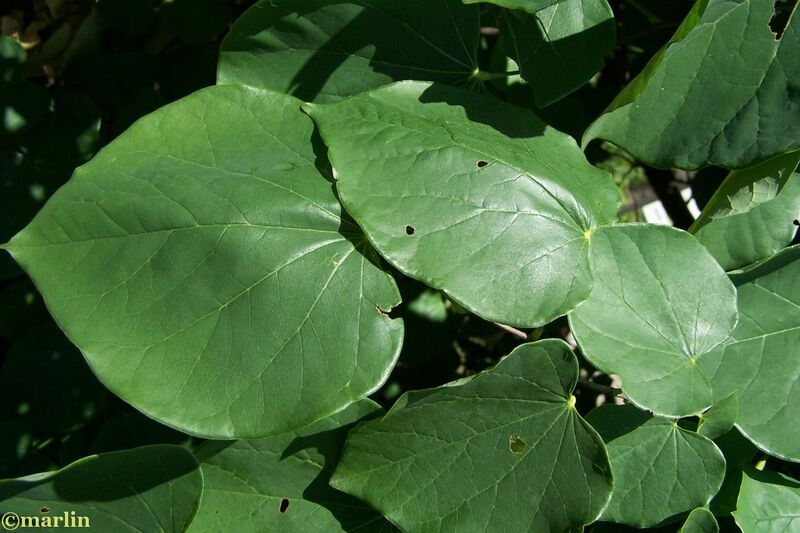 The redbud leaffolder feeds on leaves which the larvae web together. The grape leaffolder, an important pest of grape, also feeds on redbud. The Japanese weevil, Callirhopalus bifasciatus, and Norape ovina both consume redbud leaves. Other insects feed on redbud by extracting juices from the plant. The twolined spittlebug, has been recorded feeding on redbud. The terrapin scale, Mesolecanium nigrofasciatum, and San Jose scale, Quadraspidiotus perniciosus, like most of the other redbud parasites, inhabit a variety of hosts including redbud. The periodical cicada, Magicicada septendecim, lays its eggs in more than 70 species of trees and other plants, including redbud. Tree Encyclopedia is dedicated to providing scientific and educational resources for our users through use of large images and macro photographs of flora and fauna.